Answer the call of the gods to save the universe from evil. "The game had really good graphics. 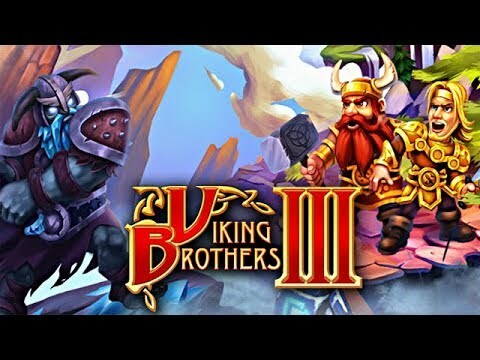 I own all the Viking Brothers Games and I highly recommend this game. It is not easy to get three stars which is what I like because I enjoy a good challenge. I will play this game several times before I get bored with it because I want to get the three stars on each level." Ready your weapons and answer the call of the gods to save the universe from evil. The Viking brothers, Evarand and Boromir, have barely recuperated from their last heroic adventure when Odin beckons. The dark god Loki is trying to tear the universe apart and rebuild it in his warped image, and the gods of Asgard need the Vikings to lead the charge in defense of all that is pure and good. The epic tale sees the Viking Brothers join the god Heimdall to solve the mystery of Loki's plan. From the icy realm of Niflheim to the red-hot depths of Helheim, Evarand and Boromir will face dark dwarfs, fire giants, a cruel witch and more. Surprises abound as the brothers follow Heimdall's lantern, which points the way.